Remember the Jersey Giant chicks we got last June? Here it is three and a half months later, and they're definitely showing their genes as giant birds. The roosters (we have three) are bigger than our adult older ladies (Americaunas, Buff Orpingtons, etc. ), and the young Jersey giant hens are just about the same size as the older birds. At only three and a half months, they clearly have a lot of growing yet to do. The hens are still too young to start laying -- we don't expect their first little pullet eggs for another two months or so -- but the boys are starting to get randy. Our farm has missed the lusty crow of a rooster since the sad loss of our beloved Snap last May, but now the boys are tuning up and finding their voices, so once more we're being serenaded. Early crowing attempts for young roosters are pretty funny. It resembles nothing so much as the caw of a hoarse raven -- no melody, no syllables, just a croak. But practice makes perfect. They're getting better, though none of them are Pavarotti yet. "He's missing a 'doodle' in there," noted Older Daughter this morning, listening to one fellow's attempt. Meanwhile, when we ordered these chicks from the McMurray Hatchery, they threw in one free "surprise" chick into the batch. We had no idea what breed or gender it would be. 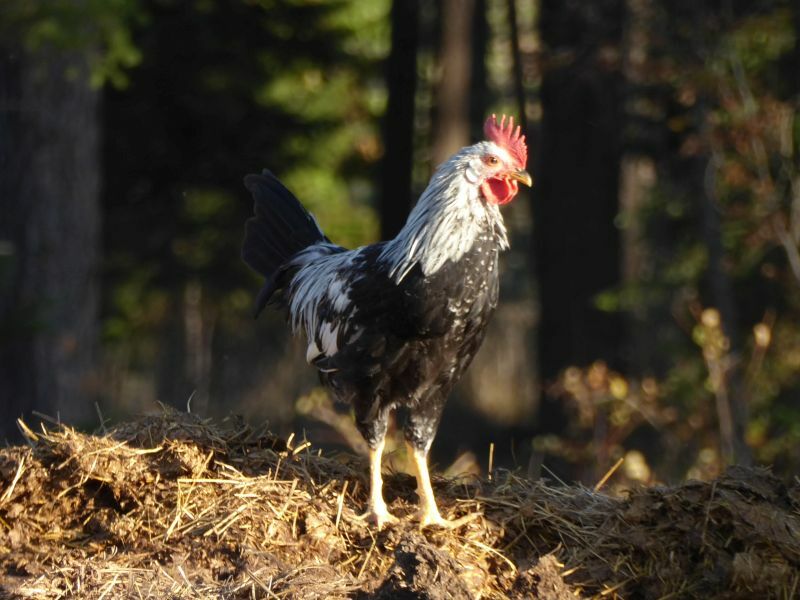 It turned out to be another rooster, a virile manly little guy ... with the emphasis on little. Especially compared to our Jersey Giants, this guy is so small we wonder if he's a bantam breed. Because he's so small, this little guy is very skittish and something of a scaredy-cat. We named him Barney and think he's the cutest little thing. Even his crow is soprano, in keeping with his size. Unfortunately we don't need another rooster; and since little Barney is just too sweet (and small) to put in the freezer, we're going to see if we can find a good home for him. Does anyone have any idea what breed he is? UPDATE: I think reader Sarah nailed it. Little Barney sure does look like a Silver Leghorn. 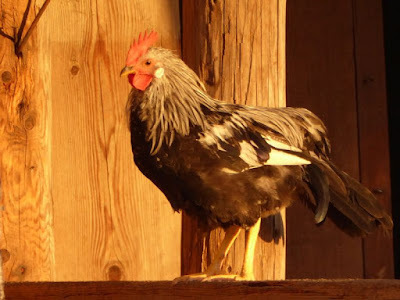 It looks a bit like a Bantam Columbian Wyandotte Rooster. Whenever I hear a rooster in training, I can't help but think of my own teenage voice. I don't know what breed sweet Barney is, but the photo of the two strutting adolescent roosters is classic. Wrong comb for a Wyandotte. He looks like a Silver Penciled (Plymouth) Rock. He is a handsome fellow. I would bet he's not a bantam just looking looking at the size difference in the chick pic. Based on your description of his current size and crow, plus the photos above, I would say that he is a Silver Leghorn. Look them up. He looks just like the photo on McMurray's website. Look at his white ears. White ears indicates he's a white egg breed. Oh, and Leghorns are known for being skittish. My bantams roosters don't seem to realize their lack of size. I'll second Sarah's guess on the silver leghorn. Those would be the beefiest legs on a bantam I've ever seen. It will be interesting to see if he grows into them. He's sure a pretty little guy. Looks like a silver duckwing to me. I've gotten all my chickens from McMurray. The "free exotic chick" is ALWAYS a rooster.... I think that's how they get rid of the dang things! 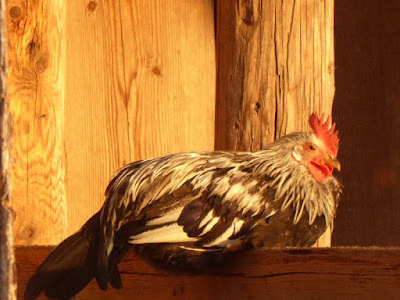 I ordered Black Jersey Giants, too, and the twelve hens and three roosters are very close to six months old. Sadly, the roosters despise our White Wyandotte hens and one of the roos decided to decapitate one of them. He will be dispatched very soon, I just need to figure out which of two it was. Another needs to be rehomed and I think things may calm down. My New Hampshire Reds and the Wyandottes are spending their days on our back porch and the badly injured hen is having her first day out of the dog kennel. She's at the back door wanting in, lol, as she spends her nights in a small crate in the house. Chickens can survive the most awful injuries.